Virginia is a charming young girl with her own blog on interior design, in which she shares her personal experience of designing a house of her own with the readers. 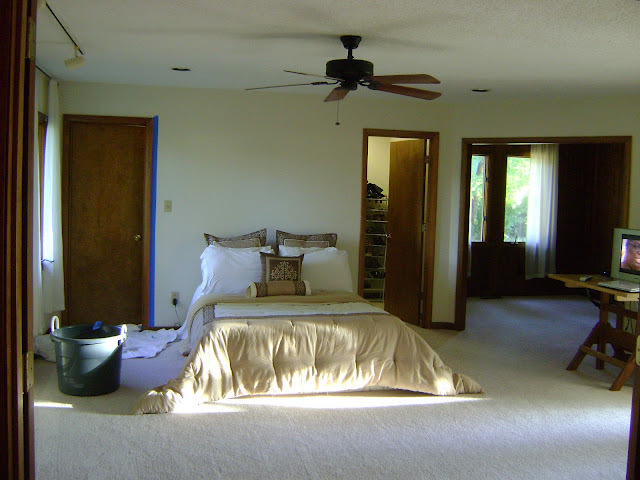 It’s always quite entertaining to look at the “before-and-after” photos of interiors, but Virginia’s experience is even more interesting, since she posted 9 (!) 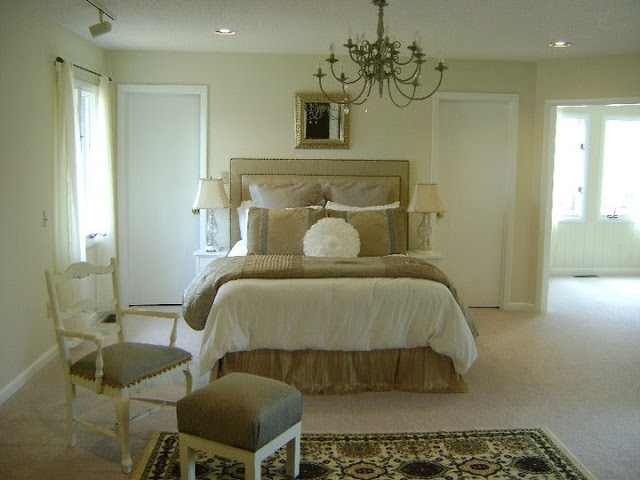 versions of her bedroom interior design that she tried before she finally found the perfect variant. 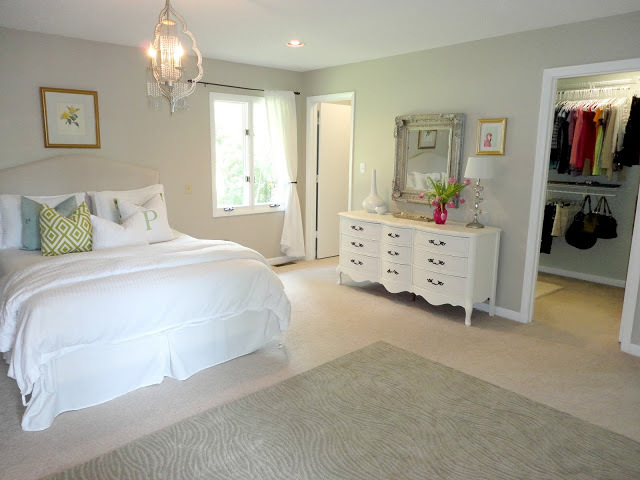 And today we’d like to take you on a virtual tour around this amazing bedroom’s evolution! 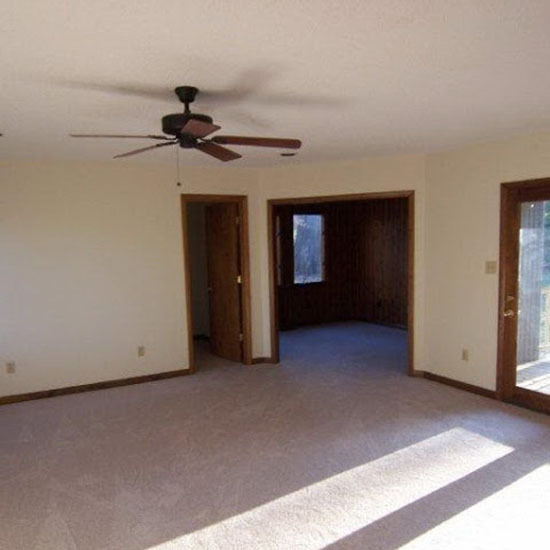 When Virginia first saw the master bedroom of her new house, she was very excited. But not because it was beautiful and cozy – it was terrible, frankly speaking – but because she felt its huge potential. The girl believed that it was a diamond that needed a superior cut. The first re-made version was pretty plain – back then Virginia was just making the first steps into the world of interior decoration. As you see, the color range and finishing materials remained unchanged. The only alteration was the addition of elementary furnishing. 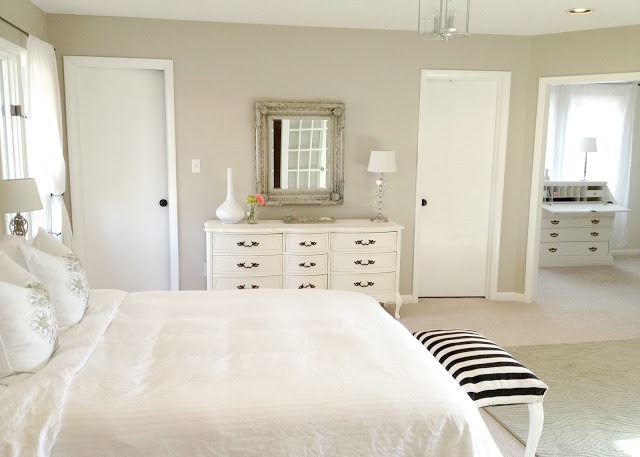 Over time dull wooden doors and wall paneling began to oppress the hostess, and she decided to re-paint them on her own. In the end the room became far lighter, livelier and more cheerful. Pay attention that the doors were painted white, and wooden wall paneling in the auxiliary room was given the same color as the walls. 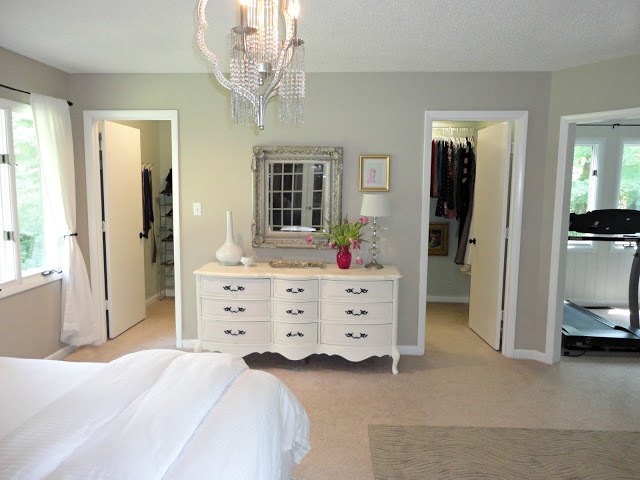 This small change alone completely transformed the mood of the bedroom. Further Virginia was determined to replace the mattress she used to sleep on with a full-fledged bed. Lacking a budget for buying a ready-made piece of furniture, she decided to do with just a metal framework for her mattress. And a gorgeous upholstered headboard was handmade by her. The image shows how the interior gradually absorbs the features of neo-classical style: pay attention to a chandelier found instead of an ugly ceiling fan and an amazing chair and ottoman that were upholstered by Virginia herself. 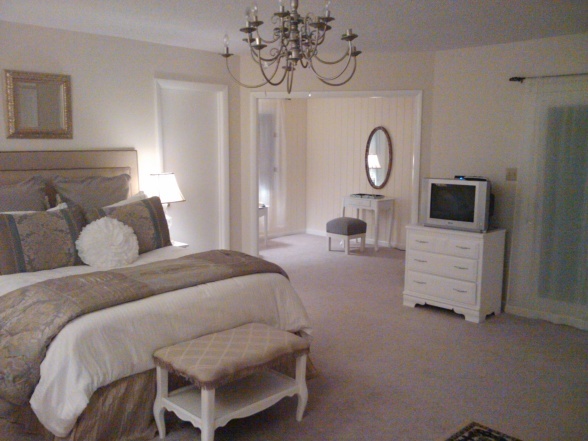 The next version of the bedroom interior is deemed one of the best, according to the hostess. 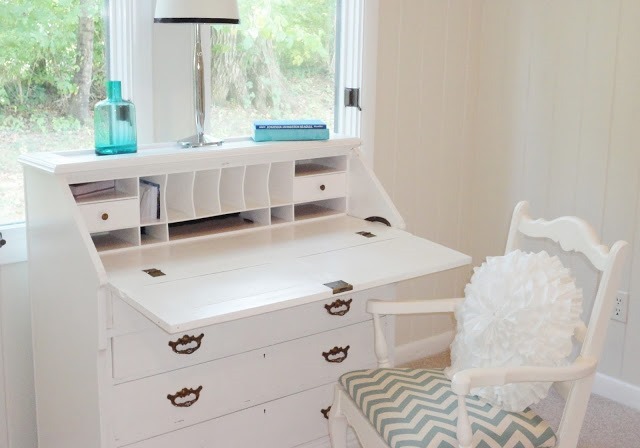 She finally bought a chest of drawers that she was dreaming of and, of course, re-painted it into a white color. But the most vital change related to furniture rearrangements: the bed moved to the adjoining wall, and its place was taken by the above-mentioned gorgeous chest. Besides, Virginia purchased a couple of bedside tables on sale, which she now believes to be a mistake, since “to find the right stuff on sale one should have a particular gut, and back then I didn’t have one”. The wall color also suffered a change: it became darker and more saturated. And the floor was complemented with a sweet elegant rug by Home Depot. 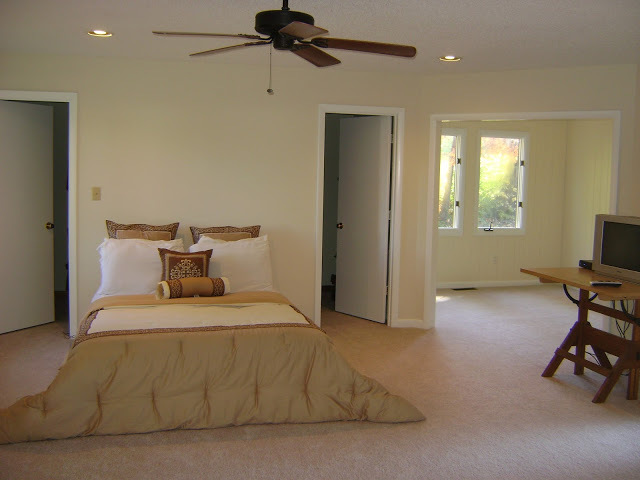 The following version of the bedroom is also quite different from the previous one. 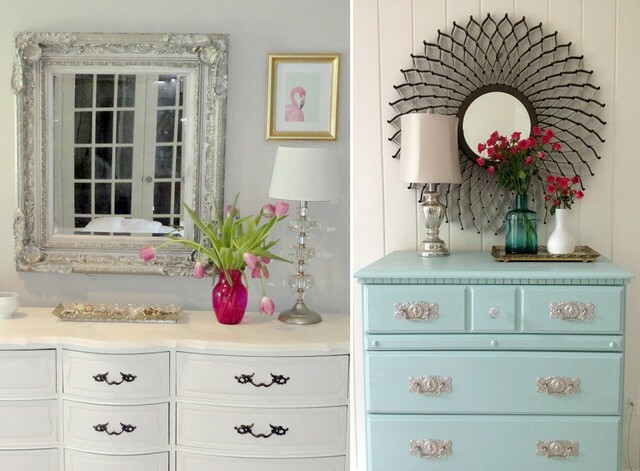 The mood of the interior was once again changed by re-painted silvery mirror frames, new black furniture handles and refreshed dark glossy top of the dressing table. 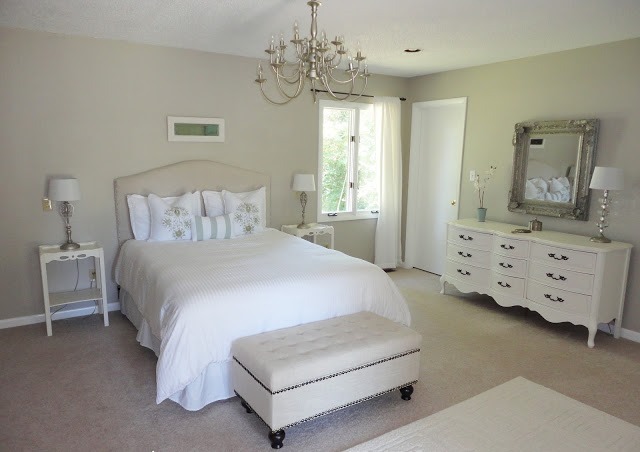 To avoid coloristic chaos Virginia replaced golden bed linen with a pure white set. And the auxiliary room was turned into a kind of a study. The role of its centerpiece was given to the grandmother’s antique chest of drawers, which also couldn’t escape the “white destiny”. P.s. 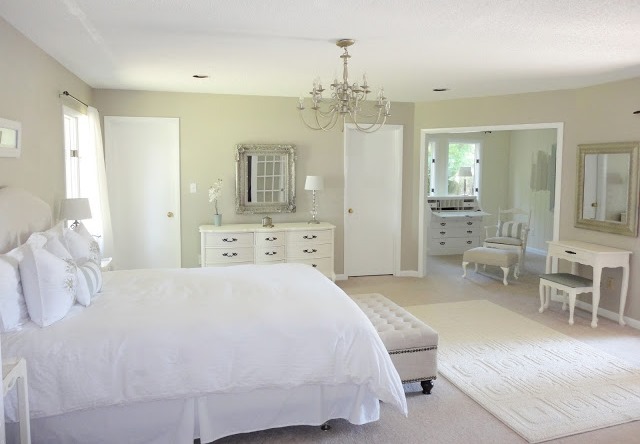 Too much passion for white color can play a sick joke not just to amateurs, but even to qualified interior designers. Besides numerous merits including visual space expansion and trendiness, this color has negative aspects too. Its reasonable application creates a light and airy background, but going too far one risks to get a sterile and emotionless interior. This variant didn’t last long, since the hostess quite predictably got tired of too much white. 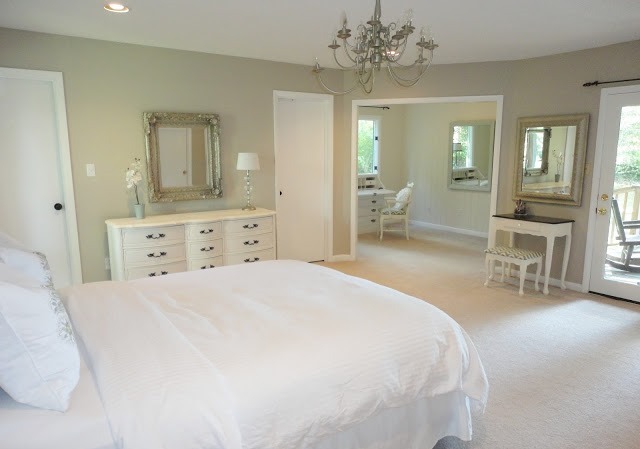 Virginia really got carried away a little bit: she re-painted the dressing table white again, added a white carpet and a light gray bedside ottoman. Besides we see that the headboard also changed – its new upholstery matches the new ottoman. In version 9 the girl decided to focus on accessories. For a start she replaced the pretty massive chandelier with a more exquisite lamp. 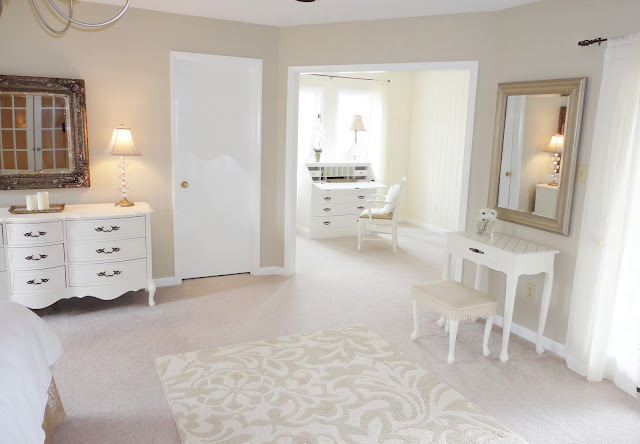 The white rug was replaced with a darker carpet matching the wall color. The chest was dressed up with new bigger accessories. 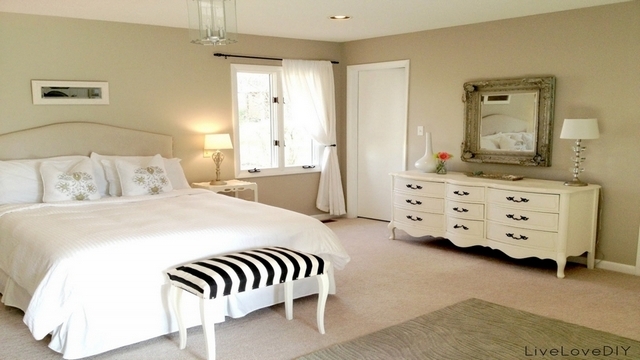 And finally Virginia painted a few throw pillows and put a contrasting stripy bench by the bed. The hostess can’t really explain why the final version seems better than all the previous ones, but only in this interior she eventually felt happy and satisfied. So what has changed? The girl just added a few bright color accents and some colored furniture. 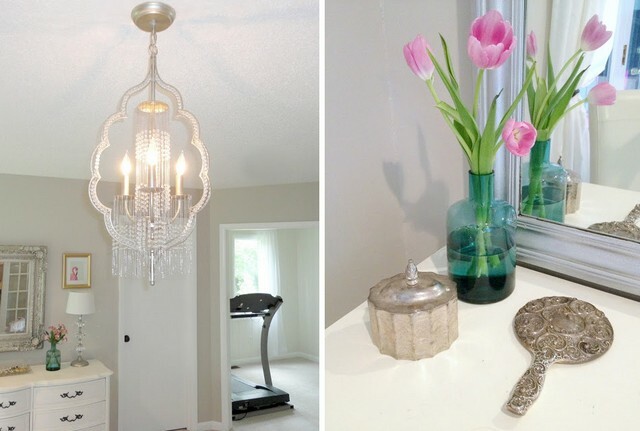 The auxiliary room was given an absolutely new function – now it’s a home gym. The jogging track is found next to a vintage pale blue chest of drawers, where the hostess keeps small stuff. And of course, we can’t but mention a new piece of art hanging from the ceiling – this chandelier really upgraded this room’s interior to a completely new level. The “silvery” theme started by the mirror frames was continued by a silver tray and an antique hand mirror, which belonged to Virginia’s grandmother. Also, the handmade pillows the girl made before now appear to be quite to the point. But the thing that Virginia focused on most of all was the walk-in closet. We hope you liked to watch the amazing evolution of Virginia’s bedroom and got charged for marvelous creativity and striving for perfection for this weekend!